Dr. Ankur Bahl is a Medical Oncologist in Max Super Speciality Hospital, Saket, Delhi and has an experience of 13 years in this field. 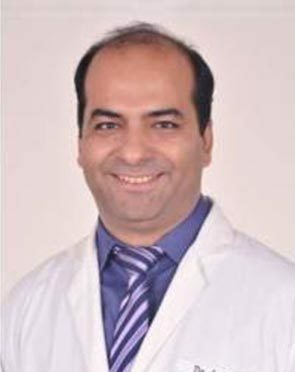 Dr. Ankur Bahl practices at Max Super Speciality Hospital in Saket, Delhi, Max Hospital in Pitampura, Delhi and Max Superspeciality Hospital in Shalimar Bagh, Delhi. He completed MBBS from Maulana Azad Medical College, New Delhi, MD - Medicine from Maulana Azad Medical College, New Delhi and DM - Oncology from AIIMS, New Delhi. He is a member of American Society of Clinical Oncology (ASCO), European Society of Medical Oncology (ESMO) and Indian Society of Medical and Paediatric Oncology (ISMPO). Service provided by the doctor is: Multiple Myeloma, Lymphoma , Breast and Lung Cancer, Gastrointestinal and Gynecological tumors & Head & Neck and Brain Tumors. Dr. Bahl performs 22 different procedures. Click on a procedure name to see more details and to view doctors for that specialty. 4.2 average based on 52 reviews.